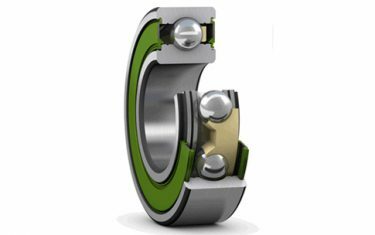 The demands for safe design and lighter, competitively priced products have put a new emphasis on predictability of rolling bearing performance. 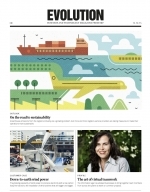 This has prompted researchers to update standards for bearing life to take into account progress in engineering technology. Present standards for bearing life calculation are based on work carried out at SKF in 1947 by Gustaf Lundberg and Arvid Palmgren. The life equation was formulated using the Weibull probability theory of fatigue developed in 1936. This allowed the calculation to include bearing reliability. It marked a substantial step forward in the achievement of predictive methods for the applications of this essential machine element. The ability to estimate the life of a bearing and to select, on a rational basis, a specific bearing suitable for a particular application was a breakthrough for engineering design. Since then, science and technology, in particular tribology, have made tremendous strides. 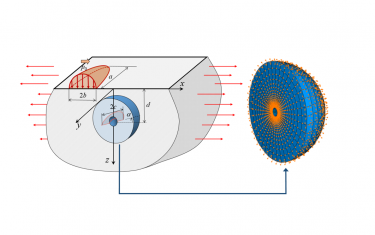 The latest theoretical knowledge and calculation techniques supported by powerful modern computers are now applied in bearing technology and design work. Also, steel manufacturers can make cleaner steels to more accurate and consistent formulations. In addition, greatly improved lubricants allow better separation than before of moving contacting surfaces in rolling bearings, while modern mass production manufacturing methods produce high precision bearings to ever-higher levels of quality. Such technological progress requires that bearing life calculations take into account the improved performance of today’s bearings. Over the years, performance improvements were accounted for largely through increased dynamic load ratings, which yielded longer calculated lives. Application or adjustment factors were sometimes used to account for operational conditions, such as special bearing materials and lubricants. Until recently, these life calculations served industry sufficiently well. However, observations about the predominant failure mechanisms in modern rolling bearings have added new knowledge in this field. It has been found that fatigue failures are more frequently initiated at the surface rather than from cracks formed beneath the surface. Consequently, attention has been paid to the influence of surface finish and contamination on bearing performance. The existence of a fatigue limit for modern bearing steels has also been observed. Such considerations have resulted in the publication of improved bearing life calculations and papers studying the effects of contamination and surface finish on bearing life. ii) consideration of the stressed volume below a contact as an array of relatively small volume elements, each experiencing individual local stresses. In this way, real local stresses and many effects stemming from surface stress concentrations, such as edge stresses and contamination dents, can be introduced consistently into fatigue life predictions. Such a comprehensive approach requires access to complex computer programs for bearing life calculations, as integration of the failure risk over complicated stress fields is required. Many bearing users do not have access to such resources. Instead they usually apply simple formulae readily available in bearing manufacturers’ catalogues or standards. To support these needs, and reap the benefits provided by advances in technology and knowledge, the SKF Life Equation was made available. This equation was developed by introducing an effective real weighted stress that is averaged throughout the risk volume. The fatigue limit and the local stress were implemented into equations similar to those used by Lundberg-Palmgren. In practice, this is done by introducing a stress factor that acts on the fatigue limit of the bearing. This factor accounts for the actual stress condition of real bearings but is not included with the ideal Hertzian stress field, as used in the Lundberg-Palmgren classical analysis. This approach led to a simple expression that can be readily calculated in a similar way to the ISO 281 (1990) formulation. This equation retains much of the original simplicity of the load-life equation but also describes the performance of modern bearings more accurately than before. where the h parameter is a factor (corresponding to a stress factor) that is introduced to account for the actual stresses present in real bearing contacts. This parameter is not included with the ideal Hertzian stress field used in the derivation of the original Lundberg and Palmgren (1947) life formula. It can be shown that, besides the bulk stresses due to the heat treatment and mounting, the stress factor h depends to a large extent on the lubrication condition of the contact and on micro-scale stress concentrations due to denting or imperfections. Consequently, h is given as a function of the environmental conditions, (lubrication and contamination), and in relation to the bearing size. This is the formulation of the life equation used in the SKF General Catalogue since 1989. This equation, in conjunction with the diagrams of figures 1 and 2, can be used to calculate the life of rolling bearings in a straightforward manner that is similar to the previous life calculation, ISO 281:1990. However, equation 10 can account for specific lubrication and contamination conditions of the bearing and for the increased life that is experienced in case of lightly loaded, clean and well lubricated bearing applications. To verify the accuracy of the SKF Bearing Life Equation (equation 10), extensive bearing endurance tests were performed on more than 8,000 bearings under a variety of lubrication and contamination test conditions. 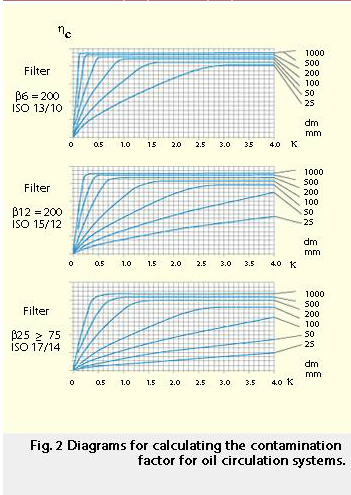 An overview of the mean L10 measured in these tests is shown in figure 3. In figure 4, a group of experimental points of ball bearing operating with a full oil film is shown. The data points of the test results mostly overlap with the corresponding life-ratio curve, i.e. aSKF , calculated according to equation 9. 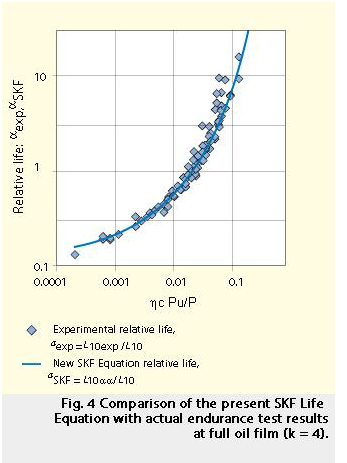 Figure 4 shows very good agreement between the relative life calculated with the SKF Life Equation and the endurance test results. 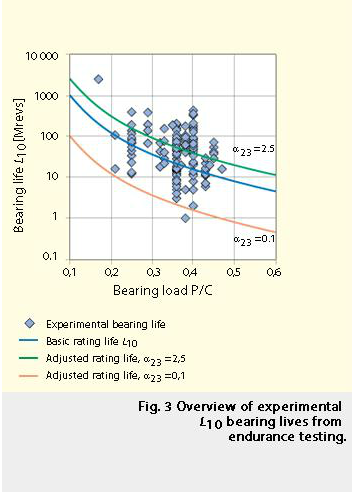 A more comprehensive evaluation of the experimental data also indicated that the total bias in life calculation could be reduced by half using the SKF Life Equation in comparison to the results of life calculations based only on bearing standard ratings. 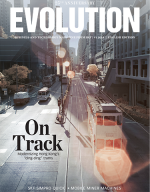 This improved accuracy provides a better match between theory and test data, validating the choice of the model constants used and the present Life Equation. 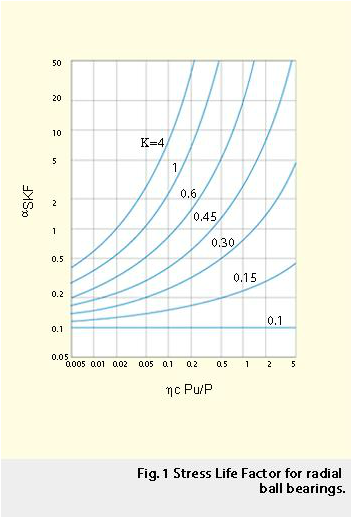 Furthermore, the asymptotic trend displayed by the function aSKF (k, hc Pu/P), figures 1 and 4 as the stress factor parameter hc Pu/Ptends towards lower stress conditions for the bearing, and is a further indication of the postulated fatigue stress limit in rolling contact fatigue. The behaviour of the curve aSKF(relative stress vs. relative life) is indeed similar to the familiar Wöhler (stress vs. number of stress cycles) curves used for plotting the survival probability of specimens subjected to fatigue testing at different stress level. Rolling bearings have made it possible to support heavy loads at high rotational speeds with good reliability and a minimum of friction. This basic technology has allowed the massive mechanisation process that has characterised the past century and has profoundly revolutionised our way of life. 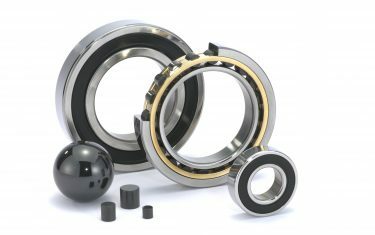 Practical tools for better selection and use of rolling bearings have a significant effect on the way machines operate, their efficiency and cost. This affects each of us through the energy consumption and running costs of society at large. The SKF Life Equation introduces a new and higher standard in life calculations to help in the prediction of bearing performance and to respond to the continual quest for better ways to design, select and use bearings. The SKF Life Equation manages to describe the complex tribo-system in which the bearing operates using a few key parameters. This is an important feature of the model that concentrates on the effect of a few important factors that have significant consequences for the bearing life. Furthermore, the SKF Life Equation recognises that the fatigue effect arising from these factors cannot be written as a linear superposition of the risks induced from individual stress components. 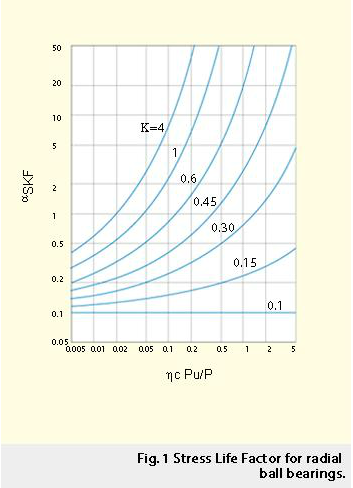 Rather than attempting to derive independent life modifying factors for lubrication, contamination etc., a single multidimensional factor, aSKF = f (k, hc Pu/P), is introduced depending on those relevant factors describing the tribo-physical state of the system. By this approach, the best use is made of the available input data, to the benefit of both the designer and the user of a machine. The good agreement with the experimental results and improved accuracy achieved using the SKF Life Equation support the use of this approach for the calculation of the life expectancy of modern rolling bearings. Ioannides E., Bergling G. and Gabelli A. “An analytical formulation for the life of rolling bearings.” Acta Polytechnica Scandinavica, ME 137, Espoo (1999). SKF Engineering and Research Centre (ERC), Nieuwegein, the Netherlands.